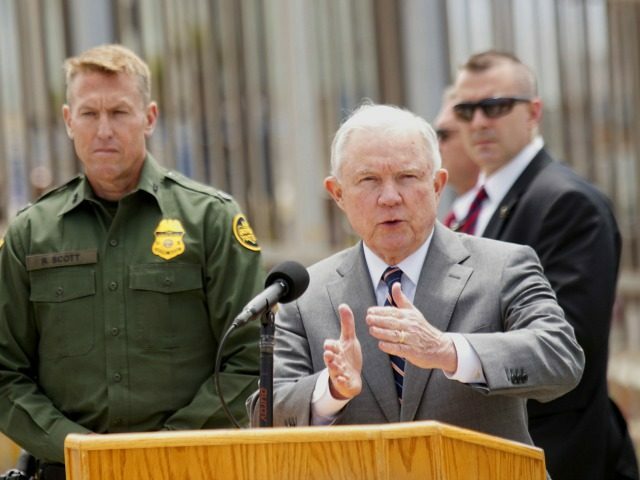 Attorney General Jeff Sessions is skillfully and successfully implementing President Donald Trump’s immigration policies, says the pro-migration, elite-left Vox website. understands the immigration system exceedingly well and is devoted to wreaking as much change in it as possible. Every Trump administration initiative on immigration, to the extent that it’s had teeth at all, has been given those teeth by Sessions and the DOJ. Sessions has generally kept his attention on doing his job — even at the cost of his relationship with the president. He’s pulled every available lever to redirect the considerable resources of the Department of Justice (DOJ) to fight the crimes he considers most serious: violent crimes, drug crime, and, most notably, violations of immigration law. But Sessions isn’t using his leadership of the DOJ simply to make the immigration court system more efficient. He’s using the full extent of his power as attorney general to reduce the likelihood that a case gets resolved (quickly or otherwise) in an immigrant’s favor — removing tools and resources that make courts more efficient but improve immigrants’ odds of winning their cases, while pressuring immigration judges to plow through cases at an unheard-of rate. He’s removing the safety valves from the pipeline while increasing the pressure. Vox is a progressive site, which generally adopts pro-migration policies that subordinate the interests of white-collar and blue-collar Americans to the interests of migrants, investors and cheap-labor CEOs. Like many other sites, Vox’s articles reflect the progressive view that Americans have a moral duty to help foreigners migrate to the United States, and it is eager to overlook the resulting civic and economic damage done to ordinary Americans — and also to ignore the huge economic gains that cheap-labor migration delivers to investors and upper-income postgraduate progressives. while his peers in the Republican Party tried to strike a balance between “good” legal immigrants and “bad” illegal ones, he has always taken a skeptical attitude toward immigrants and immigration, period, believing that the burden of proof ought to be on an immigrant to prove that she deserves to come to or stay in the US, and preferring, always, to keep worthy people out rather than let anyone unworthy in. As Sessions has put it, more people want to move to the United States than the country could ever possibly accept; the dividing line between whom the country should accept and whom it shouldn’t, he believes, should be determined by the American people based on who they feel serves the “national interest” — defined as assimilating into American culture and helping the fortunes of American workers. Sessions has generally preferred a logical, categorical approach: The problem with unauthorized immigration is that it is illegal, and that illegality itself causes real pain to American citizens. Because Sessions doesn’t rely on “bad” unauthorized immigrants to make his point, he doesn’t open the door for sympathy toward “good” ones. Breitbart News has already covered many aspects of Sessions’ step-by-step gradual reform of the Justice Department and the immigration policies. Each year, four million Americans turn 18 and begin looking for good jobs in the free market while the federal government accepts another 1 million new immigrants. Washington’s policy of economic growth via mass-immigration floods the market with foreign labor, spikes profits and Wall Street values by cutting salaries for manual and skilled labor offered by blue-collar and white-collar employees. It also drives up real estate prices, widens wealth-gaps, reduces high-tech investment, increases state and local tax burdens, hurts kids’ schools and college education, pushes Americans away from high-tech careers, and sidelines at least 5 million marginalized Americans and their families, including many who are now struggling with opioid addictions.